Best Fall Road Trips in the U.S.
No matter where you find yourself in the U.S. this fall, there is a road trip ready for you to head out on. Fall foliage drives are a great way to take in the view for the one or two weeks that the forests and woods change color before dropping their leaves. The best trips combine breathtaking vistas, dramatic hilltop or over water views and a good hiking destination somewhere in the middle. Plan a day trip drive, or pack an overnight bag to experience falls best road trips in the U.S.
Fall foliage photographers can be found on the Kancamagus Highway in northern New Hampshire, which is the most famous scenic byway in the country. There are ponds, small lakes and trickling streams all along the 35 mile stretch of Hwy 112 to stop, get out and snap some photos. You can really get away from it all on this road trip because there are few distractions along the way, just you, the road and more trees than you’ve probably ever seen in your life. The Hudson Valley road trip makes it easy to head north or south along the Hudson River and then back along the other side. Each bridge crossing is dramatic with the forests of color as a backdrop. Goshen, Kingston, Bear Mountain State Park, Hyde Park and Sleepy Hollow are all points along the way that should be explored. 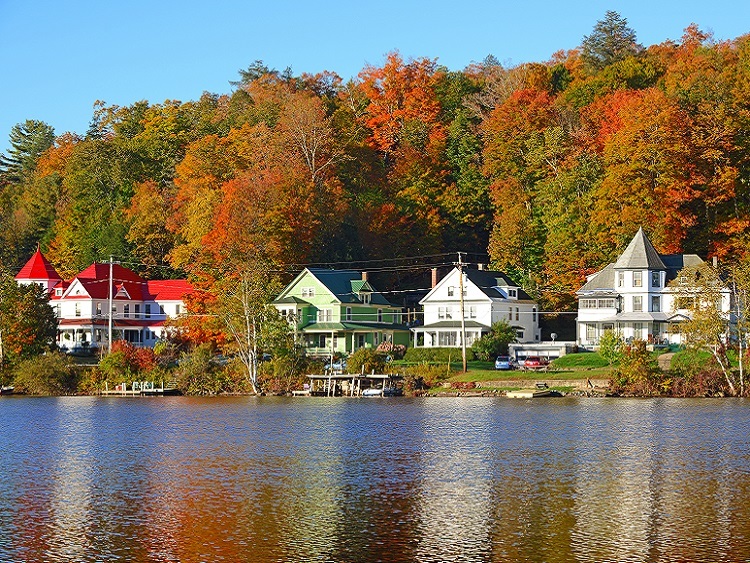 The quaint towns fit in with the autumn harvest ideal, historic sites can be explored and there are plenty of state parks for a little outdoor adventure when you need to stretch your legs and want to experience the forest up close. There are a lot of great Midwestern road trip options, but for a little variation and an option for anyone that does not want to hike, camp or get dirty, Wisconsin is your destination. Central Wisconsin is more than dairy farms, and boasts a scenic highway that takes you through forest, along rivers and yes, past a lot of farmland. There are also stops at the Wollersheim Winery, Frank Lloyd Wright homes, the House on a Rock and Native American Museums and heritage sites. Start or end in Madison, a foodies paradise, and head out on 60 for Sauk City and then Spring Green as you follow the river. If its a scenic river and fall foliage road trip that has you excited, the Great River Road is well traveled year round. The Mississippi headwaters start with a tiny creek deep in Minnesota, but the real treat spans from north of LaCrosse, WI all the way to Hannibal, MO, where Mark Twain left his mark. Stop at antique malls, historic forts and orchards whenever the inclination strikes. Then get all the Mark Twain and Huck Finn stuff in once you reach Hannibal, where you cross the Mark Twain Bridge, can picnic at the lake named after him, ride a riverboat and tour his home. Everyone fills their fall foliage road trip lists with northeastern destinations, but residents of Washington state know that they have a few hidden gems. The best part about this destination is that fall color changes happen a little later than everywhere else, so if you couldn’t get in a road trip near you, you can head to Washington through November. Start in central Washington and head west on Hwy 2, stop at the Snoqualmie Falls, catch a ferry in Everett where you can island hop to Port Townsend and then explore the Olympic Mountains, if you want to go that far. Where is your favorite place to take in all of the breathtaking colors of fall? Poll Talk - Are School Summer Vacations Too Long? I love the colors of fall, I love the leaves, trees, and the way the earth seems to be turning over something brand new after the death of summer. One day I hope to get out and travel and see more of what God’s earth offers for fall but for now, I just enjoy it from home. I would love to take a trip back to New Hampshire to see all the fall foliage. Here is FL we go from green to brown to dead. If you’re doing the Great River Road, stop in the QC and say “Hi!”. My daughter used to live about 45 minutes from part of the Great River Road. She is always telling me how much she would like to drive the whole thing during fall foliage season. We love taking road trips as a family. I am going to have to plan one with the family sometime soon after reading your post. I love the colors of fall but don’t get to see them living in Texas. I would love to take a fall trip to any of these places. I love fall in NC! The Blue Ridge parkway is fantastic! I need to take a road trip with fall, maybe I`ll go to these areas! I live near Alton, IL which includes some of the Great River Road. It is such a beautiful area! I would love to visit some of these other places! My favorite place is Skyline Drive. It’s absolutely breathtaking with all of the different colors. I can’t wait to do it this year! I’d love to drive some of the places you mentioned as well. I really, really love Fall Foliage trips! Not only is the color spectacular, but it’s not too hot or too cold. It’s just a perfect time of year to travel. I love to drive up to the mountains of North Carolina to see the beautiful fall foliage. I wish I could get the time to visit those places in the near future. I love the fall. I live in Northern NJ just a short drive to NYC. One of my favorite things to do in the fall is walk around Central Park. The pictures are so beautiful. I would love to take a road trip. I’ve always dreamed of taking a fall trip up to the N.E. states, mainly New England. Living in Florida all my life, it’s such a treat anytime I see the beautiful leaves up north. I usually don’t make it past North Carolina. I haven’t been to any of these places, but I would love to see! The leaves are pretty in New England! Someday I’d love to drive up to New England. I bet the fall foliage is amazing. I’ve only taken one of those trips and it was spectacular. I now have some new additions to my bucket list. The place that I have seen the most amazing leaves changing is a drive south to the Ozarks….rolling hills, trees and colors everywhere. I bet New Hampshire in Fall would be especially beautiful. I do love Fall colors.